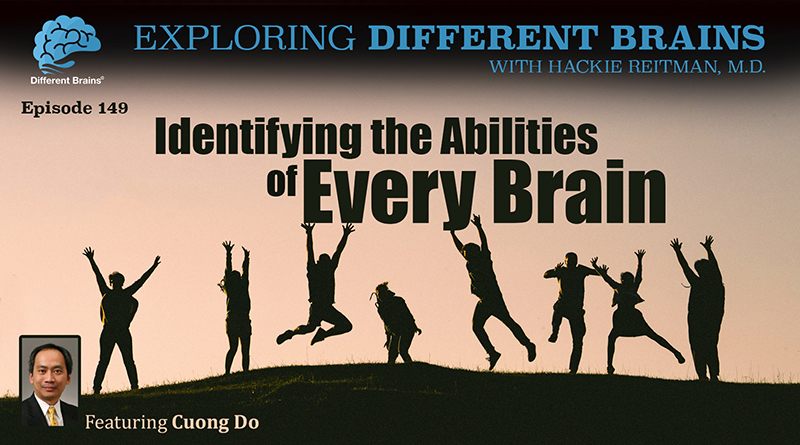 In this episode, Dr. Hackie Reitman speaks with Cuong Do. HACKIE REITMAN, M.D. (HR): Hi I’m Dr. Hackie Reitman. Welcome to another episode of Exploring Different Brains. Today we have my friend Cuong Do and Cuong has a great background. He’s like the president of the global strategy for Samsung or some such title and I’m probably getting them all mixed up. He does so much for so many. He’s on the board of Autism Speaks. He’s helping people everywhere and he took time out of his busy schedule to join us and I’m going to let you introduce yourself properly. Cuong, thanks for being with us. CUONG DO (CD): Thanks Hackie for having me today. Great to be with you. I’m Cuong Do. My day job is I do lead the global strategy group for Samsung. But on nights, weekends, and any other time during the day, I spend much of my time with philanthropic activities, but most of it is in autism, so I do serve on the board of Autism Speaks. A have been associated with the organization since the beginning, since its founding. I helped start a school here in New Jersey called Celebrate the Children. Right now we have about 140 students with special needs going to the school. I’ve helped start Profectum Foundation, which is focused on training clinicians and parents in how to work with autistic kids, and I also serve on the advisory board for Florida International University’s Embridge Program, which is their program program for autistic adults and students, among other things. HR: Wow! Well, you take my breath away, and I’m really honored to be talking to you. Keep up the great work. Tell us how you got into this, Cuong. CD: I think like most others is through our children. My son was diagnosed when he was about 2 and my wife and I were like your typical parents when you get handed that diagnosis. We were deer in the headlight. We didn’t know what to do and so we started looking around, reading everything we can, going and meeting everybody that we can and so that was 14 years ago, so that’s how we got started with this, and along the way, our approach is anything we want to do for Benjamin, we would never do just for Benjamin. Anything we want to do for him, we would have to do it and make it available to the broader community and try to help as many people as we can. HR: What a wonderful mantra. Then you developed Identifor. You want to explain to our audience what that is? CD: Sure. The context for Identifor is it starts with my work with Autism Speaks and through that work I kind of have a sense of what’s available to the community, broadly, through all the different organizations out there, but equally important, I have a sense of what’s not available. And the biggest challenge when we were looking at this problem back in 2014 is what happens when a student graduate from high school and then starts to age out. The reality back then as it still is today 4 years later, 5 years later, is that once somebody leaves school, they fall off a cliff. Right? There is absolutely no support services for those individuals anymore, and as a result the vast majority of these individuals then go on to be unemployed. In fact 80% of autistic adults now are unemployed. The vast majority are stuck without transportation, housing, and so forth, that they’re simply hanging out with Mom and Dad. To me this is a lost life, right? 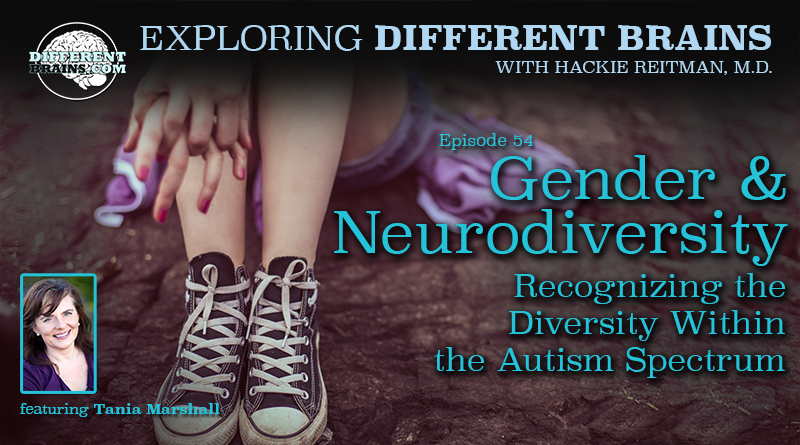 Versus the world I believe can happen is that many autistic individuals have very, very talented gifts in certain areas, so the question is how do you uncover those gifts, especially when they are in high school, and then help parents and educators understand what those talents and abilities are so you can start pointing them in a certain, particular direction, right? And so when I talk about talents and abilities, I mean things such as ability to use your body like an athlete or a dancer, the ability to see things, right, that others can’t, right, such as when we play Where’s Waldo? or when you look at your pictures and see the differences. I mean things such as do you have perfect pitch, right? So these are things that go well beyond what schools typically look at, so I want uncover and help parents stumble upon these talents that their children have so that once you kinda have a sense of what those talents are, you then can start pointing and building upon it, and kinda give a child that’s becoming an adult something to build a pond and hopefully will lead to a meaningful job in a meaningful life, right? That’s how Identifor got started was to help identify abilities and interest of these young adults. CD: I totally believe in that, right? Steven and I are good friends. We see completely eye to eye on many of them. So unlike a typical school approach dealing with autistic individuals and just assessing them using the required curriculum, parents will get a report card from school saying, “Your child is in the bottom decile of math, English, or whatever it is, versus getting a report that says, “Did you know that your child is among the top 10 percentile of those who have visual spatial skills? And if you have visual spatial skills, that then can be trained and used in lots of different ways. In Israel for example, the Israeli Defense Force goes out of its way to find autistic adults and train them on how to read aerial reconnaissance photos, right? There are the before and there are the after photos, and that exact thing can be used in the US for example, where there’s a dramatic shortage of air traffic controllers or lots of these kinds of jobs where it takes concentration and takes the ability to recognize visual cues. Many autistic individuals have those amazing visual spatial skills that go completely unrecognized in schools with the way the assessments are done today. And based upon work done by Harvard, a team up there, they basically say there are 8 innate human abilities, and what we want to do is surface or uncover abilities which ones of those 8 abilities that many of autistic individuals have so that you can start to focus on them, build on them. HR: You don’t happen to know the 8 of them off hand, do you? Not to put you on the spot. CD: Sure, the 8 include: We can talk about visual spatial skills, it could be bodily kinesthetic abilities, right? So how do you use your body. It could be musical skills, of course there is linguistic skills, which schools do look at like English skills. There’s logical skills, so math and logic. There’s interpersonal skills, right? So think of your great politician who able to relate everybody, so people person. There’s intrapersonal skills, right? So your ability to know yourself and what is possible. And the 8th one escapes me right now. HR: Well, and you’ve touched upon them. Our present system of education with one-size-fits-all is lucky if it looks at half of those, really. HR: Now if we translate that, that should be for the educational system. Now let’s transition to the employment system, which likewise in many instances has a one-size-fits-all strategy. My feeling is in the employment arena or the big company arena, we can appeal to the profit motive, which is harder to do in the educational component. For instance buddies José Velasco from SAP, we were on a panel together once, the transitions panel, and he said, “Hackie, this is not a social welfare thing. This is a business transition.” Could you elaborate a little bit about how businesses can profit themselves from this approach? CD: That exact thing applies. Businesses are looking for people who have certain skills. If you were José at SAP, you’re looking for someone who can help debug software and do certain logical things. Right? And so you want to 1: very quickly identify those individuals who have one attention span, right, the attention to details, and 2: who has the logical ability so that you can pass, see how things work, and if it doesn’t work, you can start to identify why it doesn’t work. So we can very quickly help SAP identify those individuals and not necessarily and avoid SAP going to find someone who has musical abilities but not logic skills. HR: And let me take this opportunity to stress to our Different Brains audience, this is not strictly “autism,” this is all of our brains are different. And people have strengths and different weaknesses, so when we talk about Identifor, identifying for anybody. And what your strengths and your weaknesses, what you’re good at, and what you may not even realize might be a real, real selling point. Do I have that right, Cuong? CD: Absolutely. When we started this journey, we did start it with the autism community in mine, but very early on, within the first month or two, every single parent every single adult, that we spoke to basically told us, “Please don’t limit this to the autistic community because it can help every one of our children,” right, and so as a result of that, our wildest dream is that this will be used someday by every high school, by every high school student. Right now, if you think about it, normal assessments that are done in high school is really the SAT, geared towards college entrance. But the reality is not everybody should go to college. Right? There are great musicians that you would want to go to a conservatory or a dancer who should go on to ta conservatory or those who, frankly, have no academic interests but love to tinker with things with their hands and then probably should go to a different kind of post-secondary education and job. Right? Not everybody should go get an engineering degree or whatever it is. So by understanding which of these eight abilities you are really strong at, you can help really explore what really makes turns you on and what would give you a meaningful, fulfilling life. HR: Why don’t we shift gears here and go to the Profectum Foundation. We’ll leave Identifor, although I’d love to talk more about that, and let’s go to, tell us about the Profectum Foundation. CD: Profectum really started because I was concerned about the limited access parents and educators and clinicians have to getting the proper training or the appropriate training on how to work with autistic individuals. If you think about it, the model for training has always been: you physically gather at some place and then you listen to, you practice with some expert that would come to that physical location and that’s how you learn, which is great if you happen, if you happen to live in those metropolitan areas that have these training facilities, but what if you live outside of these major cities that have the experts? Right? What if you live in rural areas? What if you live outside the US, in places where there are limited access to experts? You’re outta luck. And that, to me, just didn’t feel right, especially in today’s age when technology makes things much more accessible. So Perfectum, what we do is instead of making training a physical thing, we create webcasts. Our training programs are all based upon students. Most of these are clinicians and parents watching webcasts, and through our certification program, if you’re a student in our certification program, for, over the course of the year, you watch a webcast a week, once a week you get on a Skype call, essentially a video conference with your faculty leader and those that are in your classes, and that’s how you have two conversations at first, over the course, the first half of the year, the course, it is much more about imparting ideas and knowledge and ways of working with individuals. In the latter part of the course, it’s then the students filming themselves applying what they learned to their children, to their clients, to other individuals that are working with, sharing it with the class and then getting critiqued and getting pointers and how to improve. And so this essentially makes access to training much more widely available. As of right now, over half the people we train through Profectum are outside the US, and probably 2/3 are outside of a metropolitan area. HR: Wow! Are they all English speaking? CD: No, they’re not. We started with only English speaking, but we now have a large group in Argentina, for example, that have been translating the materials into Spanish and conducting the training programs in Spanish. HR: And how do you get them translated? CD: To be honest, I leave it to the pros that do the actual. Faculty members who are teaching this stuff, they the materials, they translate it into Spanish because they’re native Spanish speakers. HR: What a novel idea “leaving into the pros.” So let’s say our audience here may want to get into some of these great programs and everything. How did they go about it? HR: How does our audience learn more about you? I know that was a long time you were trying to fly beneath the radar completely, but with all you’re doing that’s impossible. How does our audience get in touch with you? How do they learn more about you? CD: They can learn more about about me, I guess go to LinkedIn and look up my name: Cuong Do. Right? Or probably the easiest way is just go to identifor.com. That’s i d e n t i f o r .com and just or perfectum.org and go under About and there’s more about me there. HR: I’d like now to shift gears to tell us about the school that you are so involved with and how a bit how that came to be and that might be different from some of the other existing schools out there. CD: Celebrate the Children is a school that currently resides in Denville, New Jersey. It’s unlike any other school I’ve seen or visited. Right? If you go back to a long-ago health issue of Time Magazine, that was the cover story for a Time Magazine article as well. One thing you’ll notice about the school when you walk in is that it’s rather loud and active. The entire approach at our school is that we don’t make it a school. We tailor the experiences for each child. Right? So if a child can’t concentrate sitting at a desk, fine, let the child walk around. Right? So the whole starting, the whole premise is start where the child is and build from there. Start by engaging with the child and once you have the child engaged, then you can start to advance and teach him or her something new. Right? So that’s the entire approach to school is premised on something we call the DIRSED model that essentially Profectum creates and teaches and trains, so start where the child is and get the child to engage with you and once the child starts to engage, you can help that child advance. Right? So that’s very different than how most schools operate. Most schools would have a teacher, would have tables and chairs, and so forth, and you’re expected to kinda sit down, maintain some kind of discipline or silence or whatever it is, and then just listen and participate that way. For many of our learners, it just doesn’t work that like that. HR: The one-size-fits-all doesn’t work for anything. I know there are reasons for it, but all that you’ve done is a testament to how we need to harness the hyper-interests. We have to identify the strengths. Yes, we identify some weaknesses and work on them too, but that everybody’s different, and we’re not just talking about kids. We’re talking about adults. We’re talking about all of us. CD: Absolutely right. So the theme of everything I’ve done over the last 15 years as it relates to autism and as it relates to the special needs community is a grounding in the belief that you have to start with the individual, and if you can connect with that individual, you then start to understand what he or she is good at, so that and once you understand that, you now are set on a path to explore things that hopefully will open up a future. Right? But then I think the other aspect is once you have identified what these things are, once these individuals are now adults, you have to support them with their needs as well. Just because you graduated from high school doesn’t mean that the need for support disappears. I would argue the need for support actually increases because Mom Dad aids are no longer around as they were before, and so how do you continue late support this person as an individual rather than as some kind of a group therapy or group support? Right? And that’s why if I can move back to Identifor, the second tool that we created by Identifor is called Companion. You can go to the App Store, whether it’s Android or the Apple App Store, search for “identifor companion” and you can download this app. This app was, it took two years to make it. We took two years to go and work with over, nearly two dozen organizations around the country that helps autistic adults with challenges they face throughout the day. So from the time you get up until the time you go to bed, what are those challenges? Right? If these organizations help us understand the challenges somebody who’s going to college faces, somebody who’s getting a job, working on a job, somebody who’s living on her own or his own for the first time. Right? And so we learn such things as the number one reason autistic adults get fired from a job is they often do not come back from breaks on time. The number one reason why someone going to college gets in trouble academically is they get so engrossed playing video games or whatever it is they’re doing it night and don’t go to bed on time. Right? So basic things like that. If we know that, we can build an app to kind of remind you of all kinds of things. It will help track what courses you’re taking and if you’re in that course, when exams are, when essays are due, and in the run-up to exams and essays we use as an artificial intelligence driven human avatar, where all you know is she’s Abby. Right? And Abby will start asking you question: How are you studying? How are you preparing to study? You want me to set a reminder? Schedule some time to study? Or she’ll remind you to go to bed, whenever you want to set it or come, it’s 5 minutes until you have to be back at work from your break; it’s time to start wrapping up. So those kinds of things are made available to help and support an adult as they go throughout their day again for the exorbitant price of free. HR: Well, that’s great. Cuong Do, is, first of all, I hope you come back and join us at other times and there’s so much more to learn from you and I really admire all the great work you’re doing. Keep it up. Is there anything else you would like to discuss today that we have not yet spoken about? CD: No, I’d just like to summarize in in the sense that what you guys stand for, Different Brains, is exactly what I personally subscribe to which is every single person is different. Right? And if you can start to connect with each individual the way that they want to be connected to, start with them wherever they are, that’s how you help every one of these individuals advance, learn, develop and eventually have a meaningful life, but what that really means is that each person has a different way of doing everything, and anything we can do to support it, we’re game. HR: Well, thank you very much and we want to help you. Not that you need help. Whatever we can do at differentbrains.org and I’m going to look for fertile soil to collaborate with, to help advance your whole agenda. Cuong Do, it’s been a pleasure to have you today. Thanks for being with us on Exploring Different Brains. CD: Terrific. Great to be with you today. Thanks for having me. (3 min 36 sec) In this episode, a man with Down syndrome retires from Wendy’s after 20 yrs. 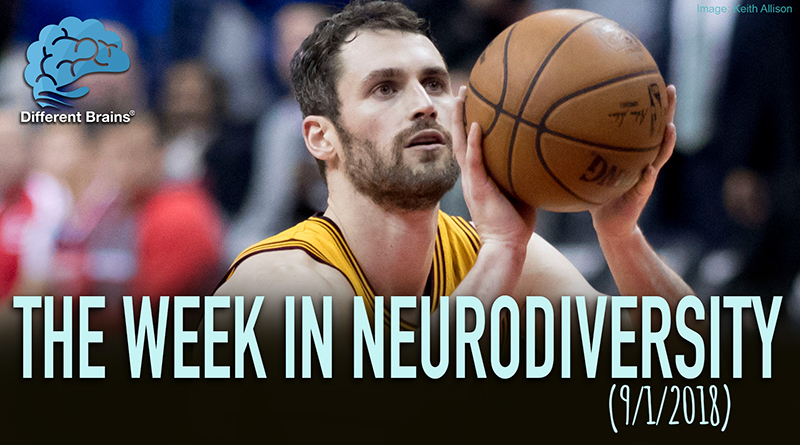 of working, a family looks to raise awareness fro apraxia, NBA star Kevin Love discusses his battle with anxiety, and more! 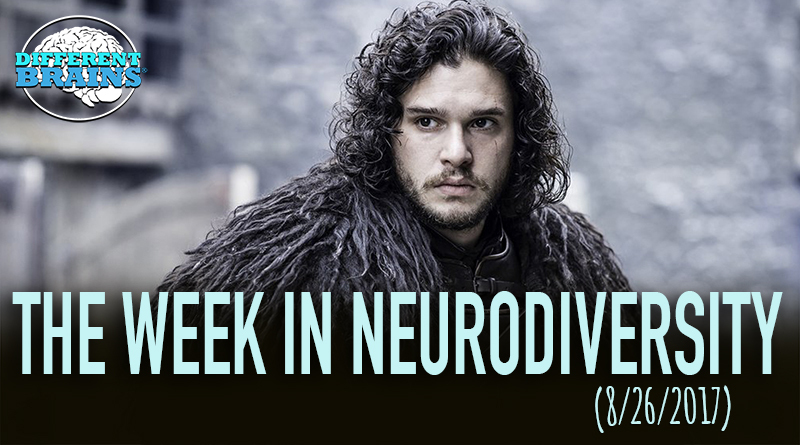 (3 mins 46 sec) In this episode, a man finds pickleball to help his Parkinson’s, Freddie Highmore is set to star as a doctor on the autism spectrum, and Kit Harington discusses disability advocacy! These stories and more in this week’s edition! In this episode, Harold Reitman, M.D. continues his conversation with Australian psychologist and award-winning author Tania Marshall. Can Coffee Prevent Alzheimer’s and Parkinson’s?